I'm a big proponent of working with the opportunities and sightings you have while there is decent light. So often we chase the sightings of the big species and forget to photograph and observe the myriad of other species on offer in the bush. During our recent trip to the Kalahari, I often played around with some slow shutter speed techniques. 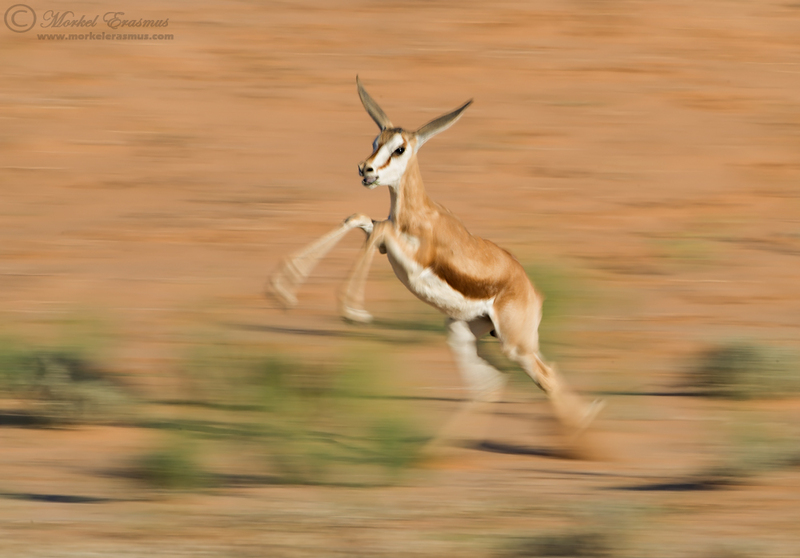 While we were sitting among a herd of about 400 Springbok, the fawns started pronking, prancing about, running and being silly in general. I immediately seized the opportunity to dial in a slow shutter speed and pan along with the cajoling little ones. The idea with these kind of shots is normally to have the head/face reasonably sharp or at least the outline nicely defined and the motion enhanced. I hope this inspires you to try more slow shutter speed shots and also to spend time with whatever comes your way on safari - not just the lions and elephants etc.